But the petitioners stated in their 139-page petition that "from the data in the 1st respondent's (INEC's) server... the true, actual and correct results" from "state to state computation" showed that Mr Abubakar polled a total of 18,356,732 votes to defeat Mr Buhari whom they said scored 16,741,430 votes. 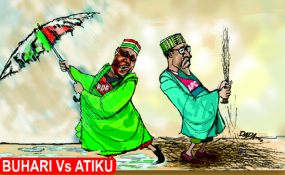 According to it, the results were the total votes scored by the candidates in 35 states and the Federal Capital Territory Abuja, as there was "no report on server" about the results from Rivers State as of February 25. The five grounds of the petition read, "The 2nd respondent (Buhari) was not duly elected by the majority of lawful votes cast at the election. Arguing that Mr Buhari was not qualified to run for the office of the president, the petitioners argued in part, "The petitioners state that the 2nd respondent (Buhari) does not possess the educational qualification to contest the election to the office of the President of Federal Republic of Nigeria.